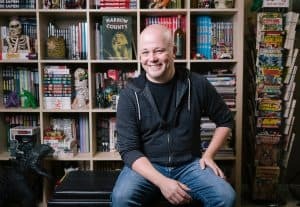 Cullen Bunn is an American, award winning, best selling writer who has written iconic characters such as Captain America, Deadpool, Spiderman & Wolverine for Marvel. Superman, Batman, Aquaman and Green Lantern for DC. The Shadow and Voltron for Dynamite, the award-winning Harrow County and Conan for Dark Horse. 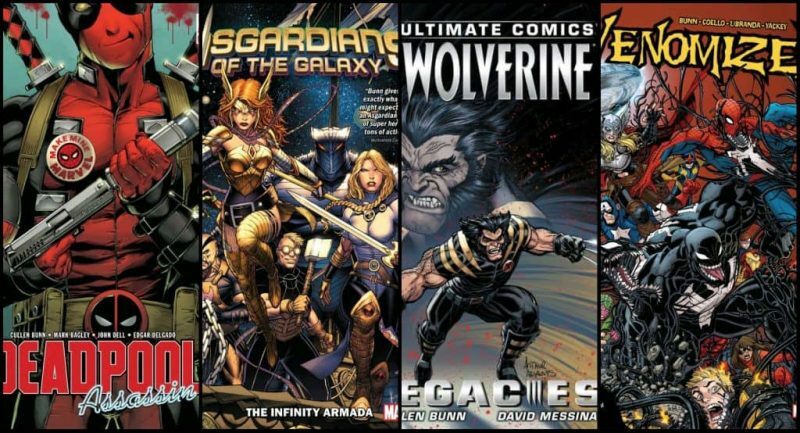 With multiple ongoing series throughout 2018 like Venomized, Dark Ark and Asgardians of the Galaxy Cullen also released a couple of successful Kickstarter campaigns. 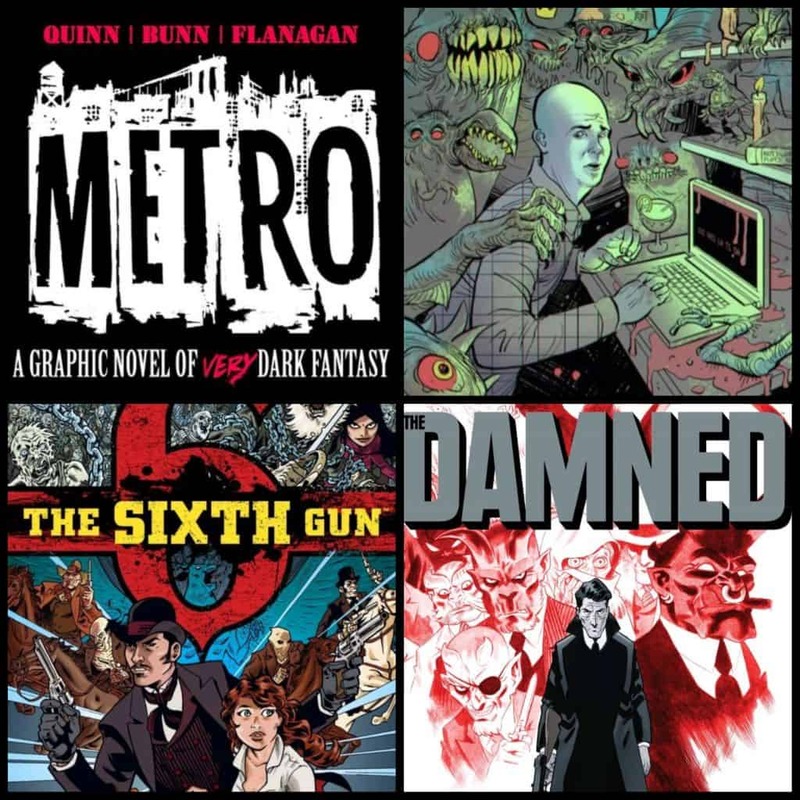 Firstly Metro, a dark urban fantasy graphic novel, created with TV’s Impractical Joker Brian Quinn and Comic Book Men’s Walt Flanagan. Secondly, A Passage in Black a collection of horror stories in black and white. The two books which brought Cullen to my attention was The Dammed and The Sixth Gun which he created and wrote being released through Oni Press. The Sixth Gun in particular is a 50 issue comic series I recommend to anyone and everyone when asked about good comics to read. JS: You are obviously a natural writer, is this a passion you have had since a young age or was there a defining moment that made you start writing stories? Yeah, I’ve always loved telling stories. AS a young kid, I was writing and drawing my own comics, usually about Godzilla and King Kong (laughs). In 3rd and 4th grade, I was writing and drawing a comic for my friends titled X-Laser Knights. A little later, I started making ash can comics that I sold at local conventions. I’ve known from a young age that I wanted to tell stories. JS: Having written so many characters over the years you must be a comic book fan. Who were your favourites growing up? I had many, many favorites as a kid. The Micronauts, the X-Men, Dreadstar—those were some of the characters who really made me love comic books. JS: Who would say have been your biggest writing or artistic influences growing up? In comics, I think Bill Mantlo, Jim Starlin, and Chris Claremont would rank pretty high. Outside of comics, I’d say Robert E. Howard, H.P. Lovecraft, Stephen King, Michael Moorcock, and Joe Lansdale have all been huge influences. JS: I have seen through your social media posts you have quite a collection of your own comic books. 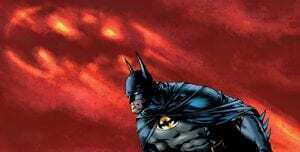 Are you a comic book collector in general or do you only collect certain editions/issues/characters/creators? My collecting tastes have changed a lot over the years. Once upon a time, I collected almost everything, I think. Nowadays, I still collect X-Men and I buy key issues when I find them. I also buy books that meant a lot to me as a kid. I love to get runs of comic books bound into custom hardcovers. I have quite a few of them now, and I’m always on the lookout for new runs. JS: Do you have a different creative process when writing for an established character for Marvel or DC compared to writing/creating your own book like The Sixth Gun? Not really. I tend to approach the stories in the same way. I might do a little more outlining with a project for Marvel or DC since those characters are not my own. Outlining up front helps prevent any conflicts with what other writers might be doing or publishing plans for the characters. JS: You have posted on your website scripts to some of the books you have worked on as a tool to help people understand what’s involved in drafting a comic page. How do you feel when you start seeing the pages you have written come together by the artist? Also, do you get involved in the detail of the drawing or do you leave the artist to do their thing? Seeing those amazing pages of art come in is one of the greatest thrills of writing comics. It’s an amazing feeling. My goal with scripts is to tell a story and convey mood and theme, but I try to let the artist work their magic. JS: Having written some of the biggest names in comics there is one character that I personally feel your style would be a natural fit and would love to see happen one day, John Constantine. How do you feel about Constantine and would writing a Hellblazer story be of interest? If so, what would you like to do with the character? I would love to write Constantine. I’ve pitched the idea out there to the powers that be, but it hasn’t taken hold just yet. Maybe one day. Fingers crossed. I’d have a blast telling a really, really dark Hellblazer tale, like the good old days. JS: Another favourite character of mine is Lobo and your run during the New 52 was a real highlight. Did you enjoy writing such a bizarre character and would you return to it if the opportunity presented itself? I had fun writing Lobo. I don’t know, though, if I’d return to the character. Maybe if I could write something closer to my original plan—a story featuring both the New 52 Lobo and the Main Man Lobo as brother bounty hunters adventuring through space. JS: Which DC character that you haven’t wrote before would you most like to write? Swamp Thing. Hands down. I’ve written him as a guest star in other books, but I’d be over the moon if I had the chance to write him as the star in a longer run. JS: Similar to above, are there any other characters from any medium that you would like to write about? Solomon Kane, Robert E. Howard’s Puritan adventurer, is a character I’d love to tackle. JS: Has there ever been a story that you really wanted to tell but has been refused by the publisher? If so, what was it and what was the reason they said no? Oh, sure. There are plenty of stories that have been refused, usually with work-for-hire projects where there are plans for characters that conflict with something I had planned. JS: There have been many rumours over the years about The Sixth Gun being adapted onto screen, and I believe there was even a pilot episode once upon a time. Can you tell us anything about this and if there is a possibility in the future of it happening? There was a pilot produced, but I doubt it will ever be aired. There are still wheels turning in terms of seeing the book adapted, but it wouldn’t be anything like what was already produced. All the parties involved with it have moved on to other projects, so we would be starting from the ground up once again. JS: Over the past few years there has been a number of authors and comic book writers become screen writers. Is this something that interests you? Do you have any of your own stories that you think would work better on screen rather than the page? I’m certainly interested in telling stories in whatever medium I can. I’ve recently completed a pilot script for an adaptation of one of my projects. I don’t know if I have stories in mind right now that I would rather see on screen rather than on the page. I tend to think of my stories as comics or prose first. JS: Can you tell us if we are going to see your name on a DC comic again any time soon? Never say never, but there is nothing in the works right now with DC. 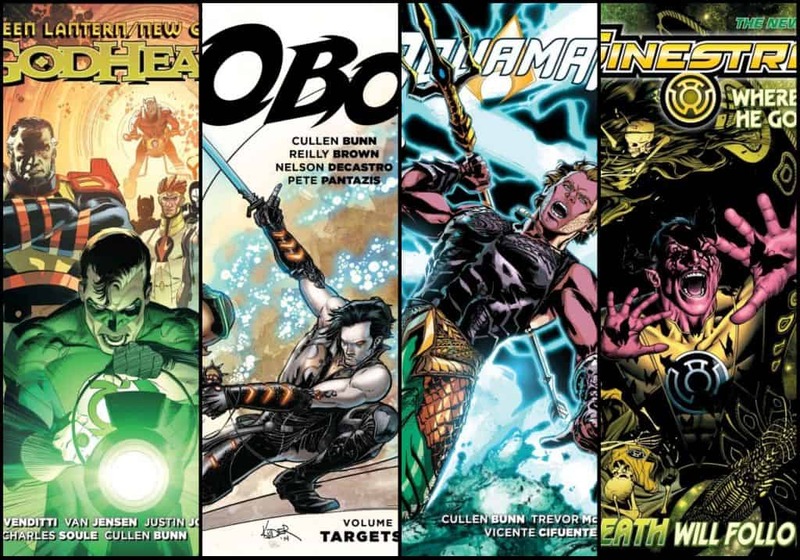 JS: As one of the hardest working writers in comics there always seem to be something new with your name on it, what should your fans be keeping an eye out for in 2019? I have several new creator-owned projects coming out a little later this year. Most of them haven’t been announced yet, but one of them will be UNEARTH (co-written with Kyle Strahm and illustrated by Baldemar Rivas) which will be released by Image. Keep an eye out for the others! Thank you so much for your time Cullen and I will be keeping my eye out for your name as always. The idea of a Cullen Bunn Constantine or Swamp Thing series sounds too good an opportunity to miss. I hope Jim Lee, Bob Harras, Dan Didio and co at DC Comics see this and take note. Cullen is ever active on social media and you can find all his details below. WEBSITE – If you haven’t been there lately, you should check it out. I’ve started posting a lot more content and news on the site. PATREON – Here, I post a serialized novel, a serialized comic book, short stories, and other cool materials. TEQUILA CAST – Where I drink tequila and tell you all about it. 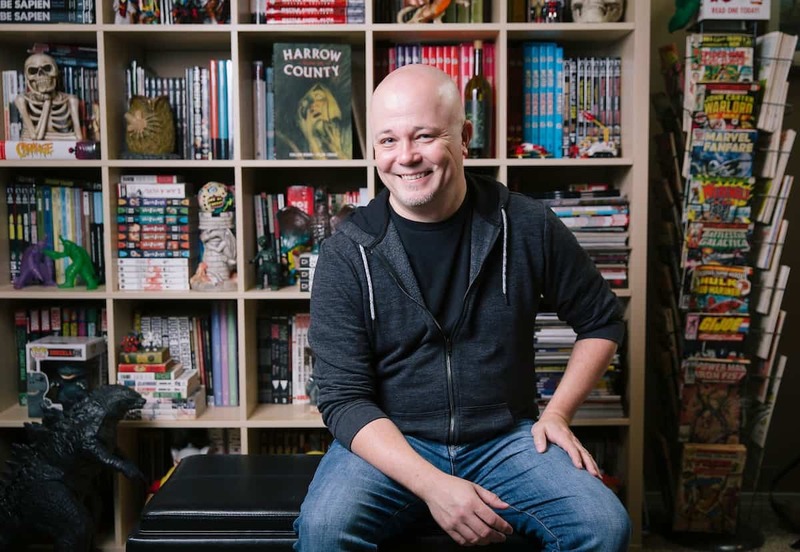 NEWSLETTER -Cullen Bunn E-Newsletter, you can sign up for it yourself at this link.